At some point in the aftermath of war and political upheaval, someone clearly took stock of Berlin and said, “Right – let’s re-spin this thing, let’s start fresh and do this right.” It’s creatively re-designed, with thoughtfulness that makes an urban planner type tear up a little. The centre is very clean and walkable, with a huge leafy park, wide sidewalks, plentiful public transport. There are solar panels on top of the bus stops to power the glowing advertisements. 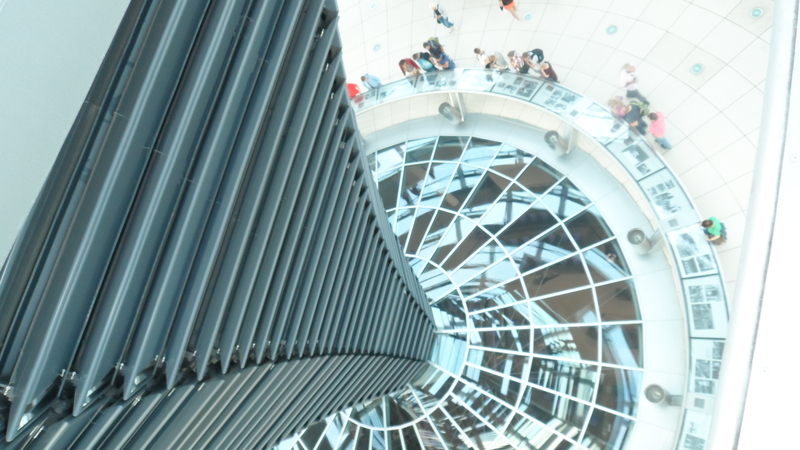 In the Reichstag Building, a huge spiralling funnel covered in 360 mirrors has a tri-focus of inspiring awe, diverting rainwater, and reflecting light for the parliamentary meetings below. 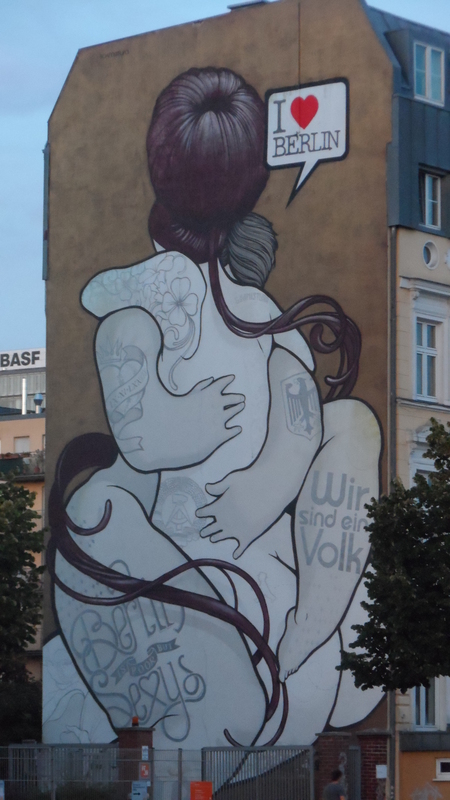 The line between west and east Berlin has blurred over the years, but an undertone remains. The west side centre is chock full of big name shops and is squeaky clean. East Berlin just over the bridge (near Warschauer Str) is a bit rougher but lovable and has better graffiti. I could spend some serious time in the Skalitrzerstrasse area, on the river side of the East Side Gallery (a strip of the Berlin Wall left standing and decorated with art). It’s what the Brick Lane area could be if the hipster was turned down and the artsy turned up. We have a beautiful burger at Görli Burger and wander into a half-lit hovel called Madame Claude. It looks closed, but a waft of trip-hop music floating up from the darkened stair beckons us below. We enter a tiny world of the absurd. The ceiling’s a floor and vice versa – there are chairs, an umbrella stand, flower pot, and sundries mounted above our heads. The décor is trip-boutique-grunge…some brown 70s-era eye things dot a wall; around the corner, a forest room; the ladies’ room has no water in the tap. A very burly man with a big grey beard and a towel over his shoulders wanders around, clutching a bottle. Some guys are saying the “F” word a lot, sprinkled in boisterous German. A couple of musicians invite us downstairs for a “concert” of trip-hop music with “colourful sounds”, followed by a burlesque performance. The music takes a turn towards foreboding – organ zings and a man demanding “du kam!” or something. Wind noises. My beer is called “Lagerbier Hell”. I’m in Berlin, baby, and I love it. This entry was posted in Europe Farewell Tour, Museums and Culture, No Graffiti!, Restaurants and Cafés, Travel Adventures and tagged Berlin, Germany, Reichstag, travel. Bookmark the permalink.